Taking your dog for a walk sounds pretty easy. What's there to think about? You put on your walking shoes, slap on a hat and sunscreen if it's sunny and attach the lead to your dog's collar. Then off you go. Well, there may be a few more things to take into consideration. Take the age and health of your dog into account. Restrict the length of the walk if your dog has been unwell or age is causing him/her to slow up. Your dog will probably still enjoy a walk but you may need to walk more slowly, stop more often and not walk as far. If your dog has a heart condition get advice from the vet about walking him/her in regard to the weather and suitable distance. 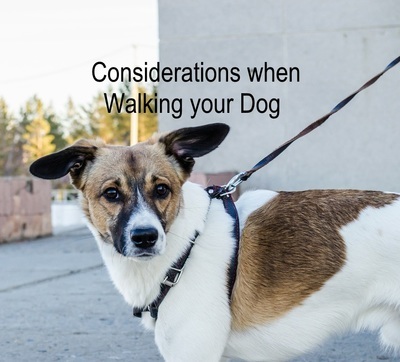 Talk to the vet if your dog appears stiff and in some pain when walking. Arthritis injections may make her/him more comfortable. Take a bottle of water and a collapsible water bowl on warm days or for long walks. Avoid walking in the heat of the day. Choose early morning or the evening to make walking more pleasant for both of you. Ensure the pavement isn't too hot for your dog's paws. 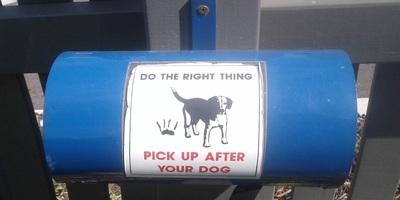 If you can't hold the back of your hand comfortably on the pavement for five seconds, it is too hot for your dog's paws. Keep your dog on a leash where it is mandatory. This is most areas. Be aware of the maximum length of leash allowed. Avoid areas of prickles or broken glass. Avoid a street where you know there is a dog who can jump the fence or is not properly restrained. Restrain your dog from sniffing in tall grass, what's hiding there? There could be a snake or spider. Be aware some people are afraid of dogs. 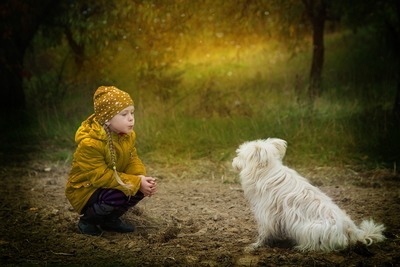 Restrain your dog so it does not sniff a person, especially a child. Definitely ensure it does not jump up at another person, even if you have a small dog. If children ask to pat your dog, make it clear if your dog doesn't like his/her head, tail or other part of the body touched. You may feel it is safer to say 'No'. Watch carefully as some children get boisterous and may frighten your dog. Dogs enjoy going out for a walk and their owners benefit from the exercise. It can also be a good way to get to know other people in the neighbourhood. Do you always obey dogs on leash signs?